Golden Milk Turmeric Tea. Good for the Body, Mind & Soul. 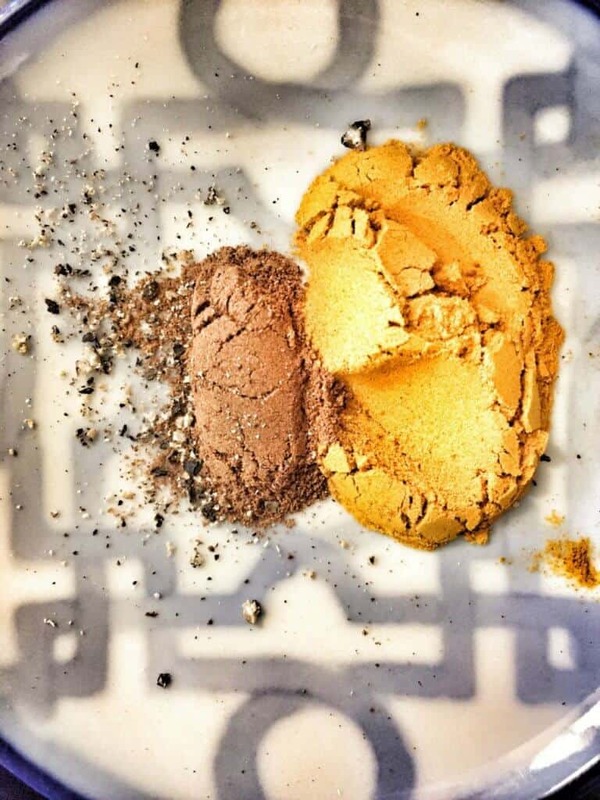 I’m a lover of Pinterest and lately there have been a ton of recipes using turmeric. Turmeric is something I love and use on a regular basis in my recipes, but never in drinks. 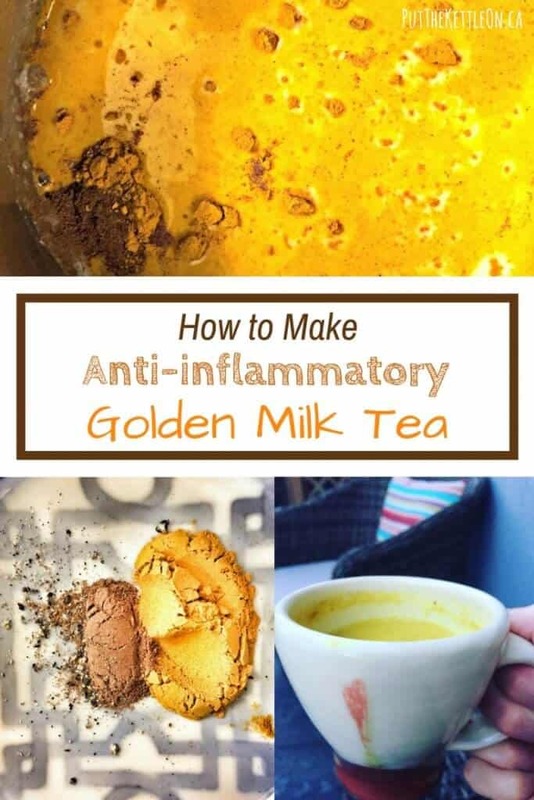 A friend of mine recently recommended I make ‘Golden milk’ tea, which aids in reducing inflammation. I have bad knees so I definitely wanted to give it a try. 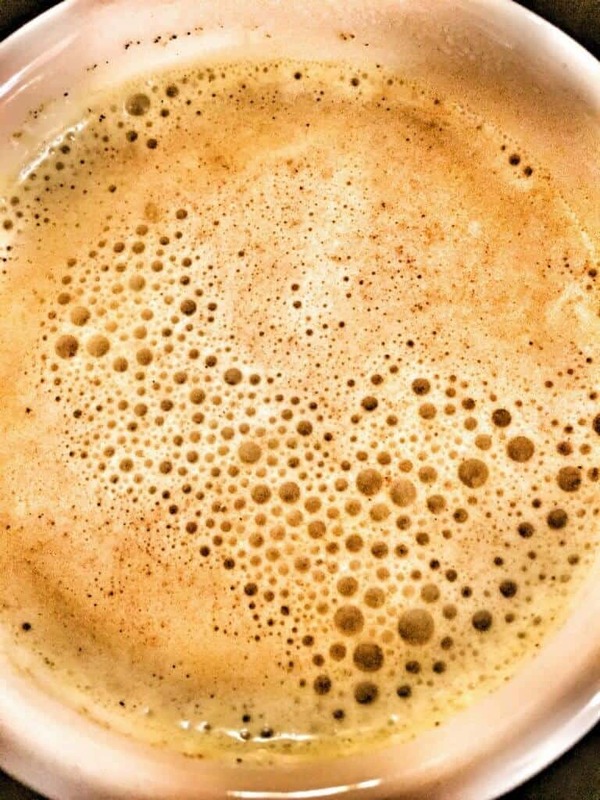 That night I found multiple recipes for Golden Milk Tea (key ingredient is turmeric) and I came up with my own version. Since then I’ve been drinking this golden milk concoction multiple times a week before bed. It’s oh so good and actually helps me fall asleep. It’s the ultimate comfort drink. What’s the “Golden Milk” Tea Hype all about anyway?! CURCUMIN: One of the most active ingredients in turmeric has been found to promote health and protect against a wide variety of health conditions, such as lowering inflammation, blood sugar levels and it is also said to have potent anti-cancer properties (destroying cancer cells and promoting healthy cell function). 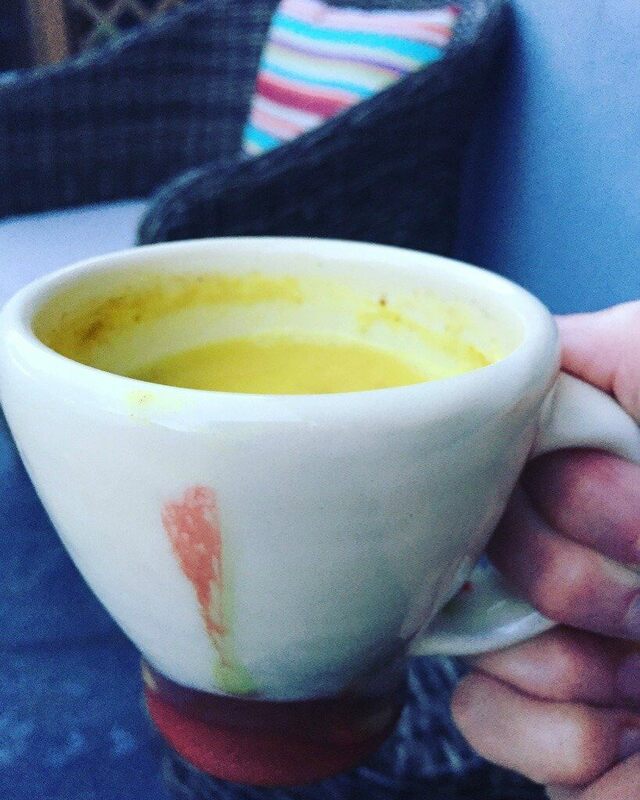 MANY OTHER HEALTHY BENEFITS: Golden Milk Turmeric Tea reduces bad cholesterol, eases symptoms of cough and colds, detoxes the body, protects liver tissue, plus helps with pain and arthritis. Get your spices ready. I like to put them all on a small dish at once before combining with the coconut milk. Put all ingredients in a pot and simmer on medium-low for 10 minutes until spices are combined with milk. Pour into your favourite mug. Sprinkle a little more cinnamon on top if you wish. Before I made this for the first time I thought the same. Turmeric is a very earthy taste, but when you combine with coconut milk and a little sweetness it’s honestly amazing. I was surprised. You should give it a try! Wow! I’ve never heard of this, but now my interest is piqued! Thanks for the recipe! It’s so good! 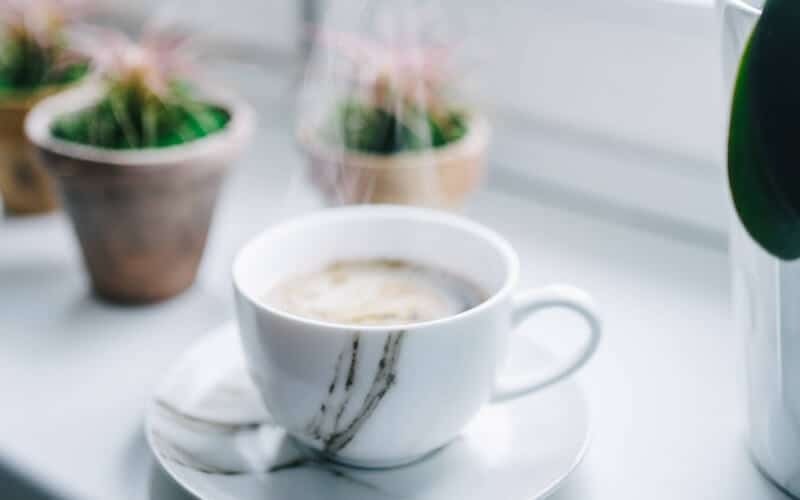 I love hot drinks, so it’s a nice change to the typical tea, coffee or hot choc. This is literally exactly what my husband needed! He’s had some inflammation from a sports injury, and this is so perfect for him! Hi Jennifer! So, your husband has tried this and it’s helped? Thanks for sharing the recipe! I keep hearing about this, I guess I need to definitely try it now! I LOVE golden milk!! I made a citrus turmeric tea that’s really tasty, too! What an interesting recipe! I’ve never heard of this kind of tea before! I have been meaning to try Turmeric tea, thanks for the recipe! Do it and let me know what you think! This is something I’m very interested in and so glad to read more about the benefits of golden milk tea. I have been taking Turmeric as a supplement, but love the idea of drinking it in its true form. Going to pin! I drink this tea but have also been looking into taking this as a supplement too. I can say that this tea is really good, so try it when you can 🙂 I love it before bed. Omg, I need to try this! My husband has really severe abdominal inflammation that has the ability to keep him bedridden for up to a week when it flares up. He can’t take anti-inflammatory medications (NSAIDS) so I’m always looking for other anti-inflammatory treatments. Thank you so much! That sounds awful. You may want to consider talking to a naturapathic doctor. There are a lot of natural alternatives – like this drink, but I know you can also take turmeric in a pill which will be much stronger. I want to try this! I have heard about all the benefits of turmeric but didn’t really know how to add it to my diet. This sounds like it is worth a shot. Do try 🙂 It’s sooo tasty! Golden milk is one of my favorite nighttime drinks. I really need to try making this. I’ve had arthritis and other issues in my left hip since I was about 17. I would love some extra relief from inflammation pain! Never made this before but have everything on hand to put it together. Will be making and trying this out to see how it works. That looks a-ma-zing! I will definitely try your recipe this weekend! I keep seeing recipes for this and different turmeric remedies. I think I have to hop on the bandwagon! Yes, there are a lot out there! Whatever one you choose, make sure it has a little black pepper as the pepper brings out the anti-inflammatory qualities of the turmeric. I am so excited to try this! I was afraid of the tuneric taste quite frankly. However, pairing it with the milk and honey sounds like a winner to me! Hi Linda 🙂 Turmeric has quite an earthy taste, so you never use tons of it – but it goes well with so many other flavours too. Try and it and let me know what you think! I’m so intrigued! My mom was talking about all of the benefits of turmeric recently, but I haven’t given it a try yet. 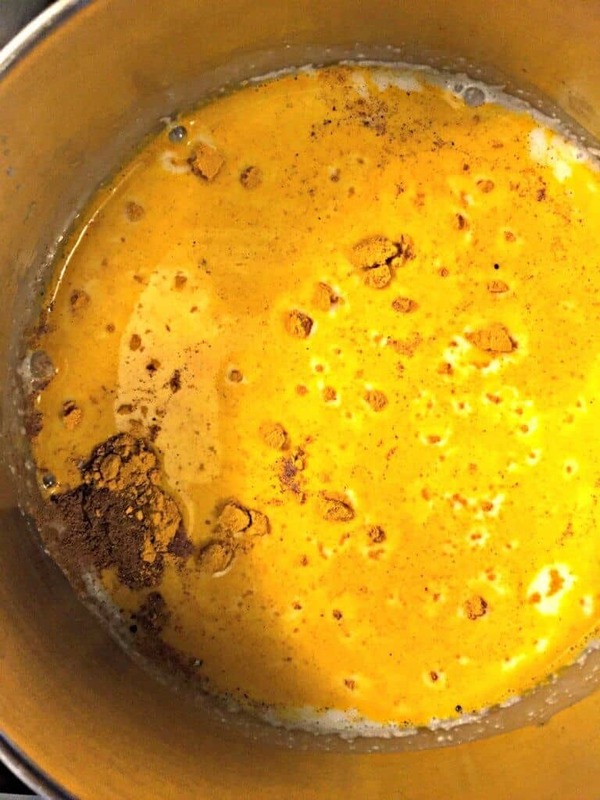 Perhaps I’ll finally start with this golden milk : ) Do you have any other favorite recipes in which you use turmeric? Hey Paula! Definitely, give it a try. It’s delish and perfect before bed. I actually love turmeric. A good spice blend I make up is ground cumin, ground coriander, black pepper, salt and turmeric. If you were making this I’d recommend 1 tbsp cumin, 1 tsp coriander and 1/2 tsp turmeric + 1/4 tsp salt n pepper. I sautee this with olive oil, onions and garlic – and then you can add anything from chickpeas, to chicken or pork chops 🙂 You can also buy turmeric tablets in natural food stores! From a mama who dealt with STD during pregnancy, let me tell you something: GOLDEN MILK is the TRUTH. It works wonders and really helps combat inflammation. Great post, thank you! That’s amazing that’s it’s worked so well for you. I just love that I can make something that is delicious but is also extremely therapeutic. It’s helps with my bad knees. Have a good one Mallaury! I have been wanting to incorporate turmeric into my diet. I have the ingredients on my shopping list! Hey Christy! I look forward to hearing what you think of the recipe. Let me know if you get the chance! I had no idea that pepper helps with absorption. I have a similar recipe that I make with rice milk, but I am swapping it for coconut milk and adding in some pepper! I totally need more anti-inflammation in my life and this is perfect! And sooooo easy – thanks for the recipe!